This recipe is fairly easy to make, and it won my biscotti a 2nd place ribbon at this year’s Oregon State Fair. 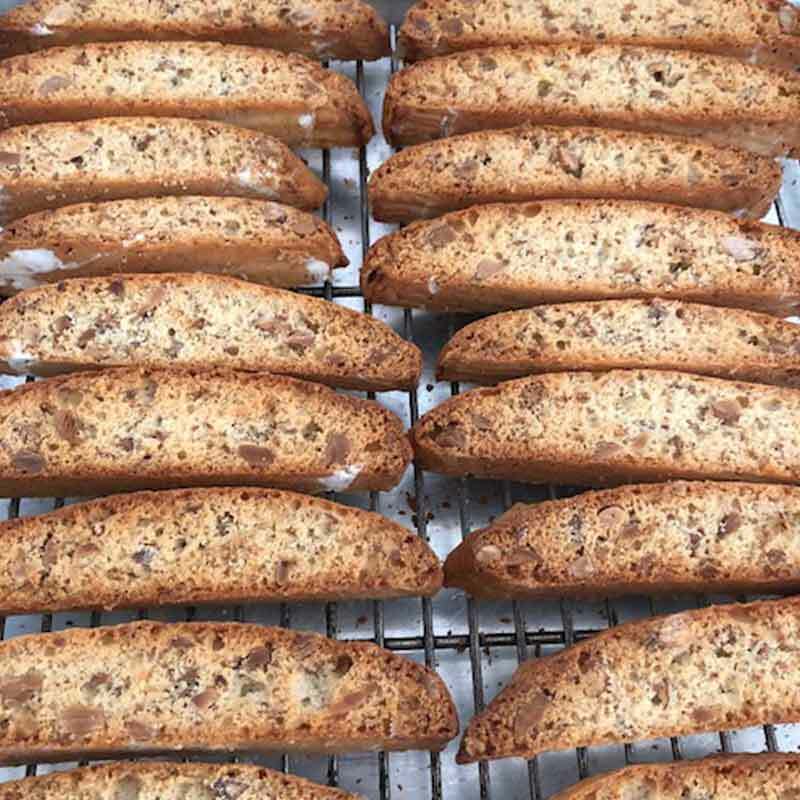 Given there were several biscotti entries, I think it’s a recipe you can trust. I was originally going to go with the biscotti recipe from the new Cook’s Illustrated Baking Book, because they have clearly done research on what makes a fine biscotti. But then I stumbled across a recipe for Biscotti from SheLovesBiscotti.com that varied so greatly from the Cook’s Illustrated recipe I couldn’t resist giving it a try. 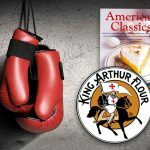 It was so old-school and different that I couldn’t believe it would best the Cook’s Illustrated recipe. Dang—was I wrong. Also, keep in mind that biscotti are twice baked. You bake the loaves once, let them cool, then cut the loaves with a serrated knife into ½ inch strips and lay them out on a wire rack so the heat from the over will flow over both sides. Then bake them again. Make sure to turn them over half way through the second baking. I added ¼ cup of very finely ground almonds to the flour mixture to give it a bit more crunch. I did this by using a food processor to grind the heck out of a very full ¼ cup of almonds. I added ¼ cup more of chopped almonds as well, for a total of 1 ¼ cups of coarsely chopped almonds and ¼ cup finely ground almonds, or 1 ½ cups almonds for the entire recipe. One criticism I received from the judges at the state fair was that my chopped almonds were not uniform in size. Not sure how to make that happen, but I’ve got another 11 months to figure it out. While it is very important to toast the almonds, I followed the Cook’s Illustrated suggestion to toast them for only 5 minutes in a 350 degree oven instead of the SheLovesBiscotti.com method which is to toast them for 12 to 15 minutes at 325. I felt the almonds tasted a bit burned when I toasted them for that long. Before the first baking, I brushed the loaves with an egg white wash that Cook’s Illustrated suggests. This gives the outside a nice look. Just whisk the heck out of an egg white and brush it on. 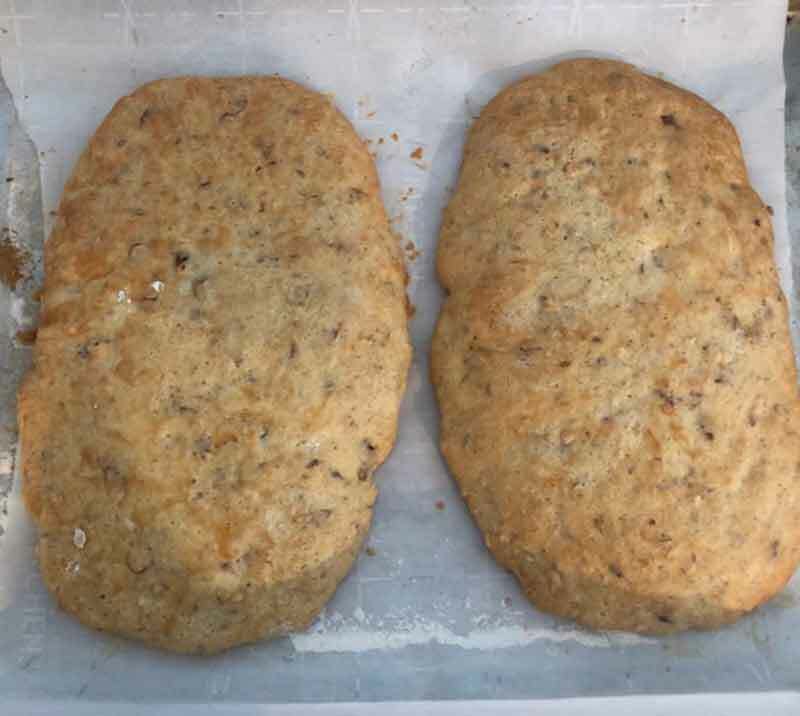 Batter then loaves after the first bake but before cooling and slicing. On the back of a piece of parchment paper, use a pencil to draw two 8” by 3” rectangles that are 4” apart. When you turn it over and put it on a baking sheet, you’ll still be able to see the rectangles. 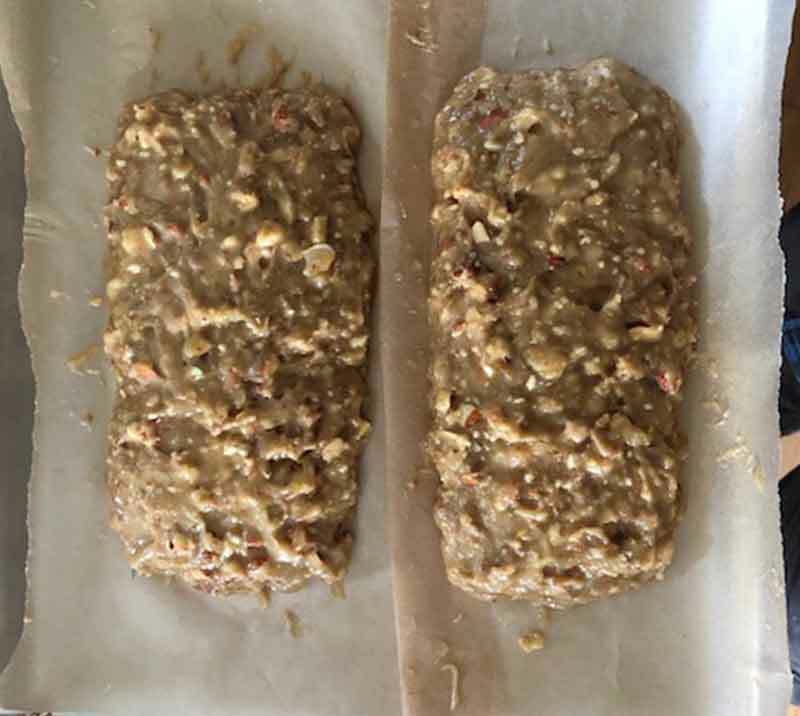 Try to pour and shape half of the dough into each rectangle. Cook’s Illustrated also suggests using a spatula coated with vegetable oil to shape the loaves, but I end up coating my fingers with vegetable oil and shaping the loaves by hand. Either way, you’ll save yourself some serious grief if you use vegetable or olive oil to coat whatever you shape the loaves with. The SheLovesBiscotti.com recipe uses ½ cup of olive oil, but I could not bring myself to use extra virgin olive oil. I was concerned it would overwhelm the delicate almond flavor of the biscotti. So I’ve been using the light olive oil from Costco. Someday, I’ll get the courage to try this recipe with extra virgin olive oil, but for now, it works so well with the light olive oil I’ve not used the higher octane extra virgin olive oil. I also added more almond extract than either recipe called for, for a total of 1 tablespoon plus 1 teaspoon. I did use natural almond extract; you might not want to add extra if you are using artificial almond extract. A few months ago, when I first started experimenting with biscotti, I got a beautiful bag of raw almonds from Costco. These almonds looked so nice they would have won the Miss America Almond Pageant. But when I tasted them, something was wrong. Seriously wrong. They had very little, if any, taste. The texture was perfect for biscotti, but the taste? Not so much. And toasting them did not help. Wow! Those unsalted toasted almonds packed a ton of delicious almond flavor, and the texture and crunch were perfect for biscotti. The bulk toasted almonds more than delivered for the biscotti that I entered in the Oregon State Fair, and I’ve used them for my biscotti ever since. So do not assume that because almonds look great they taste great. If someone had chopped up the beautiful almonds from Costco so you couldn’t recognize them, you wouldn’t have known they were almonds by tasting them. *While the Tamari almonds in the bulk food section also taste great, do not use these for biscotti. I have tried adding Amaretto to this recipe. It was not a good idea. It did not improve the flavor. If anything, it took away from it. Amazon Affiliate Links: I make a few cents when you purchase products that I link to on Amazon. The proceeds help to pay for the feed and medical care of the dogs and llamas we rescue here on our small farm. However, I try to find the least expensive products for you, which runs counter to the wisdom of affiliate marketing, where they encourage bloggers to link to more expensive products so they can make more money.